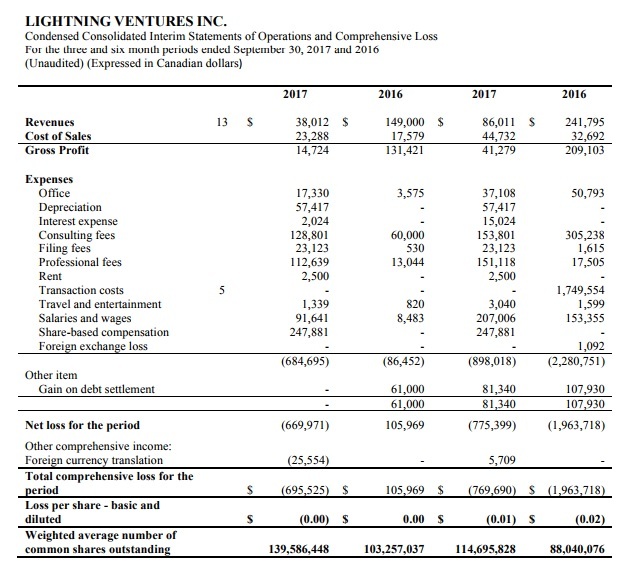 Last night Lightning Ventures (LVI.C), among many other companies I follow, released financial results. It was the company's Q2 ended September 30. On September 14, LVI said that it expects to be cash flow positive for the balance of 2017 with significant revenue growth for 2018. Here is a snapshot of the balance sheet and income statement. "The Company has not pledged any of its assets as security for loans, or otherwise is not subject to any debt covenants. Based on current information, the Company anticipates that its working capital is sufficient to meet its expected ongoing obligations for the coming year." The first sentence of the statement is important. Despite the note payable of $882,000, there is no lien on the company's assets. The second sentence is telling given all the information we have on the current state of affairs with the company. Despite having liquid assets that are a small fraction of Q2's burn rate, LVI thinks that its negative working capital position is fine for the coming year. Must be enough to cover off the current burn rate. Or there are substantially more contracts to come. The business with Blue Marble was announced and at least partially performed in November, several weeks after the close of Q2 statements with that paltry cash balance. So the company is able to perform its duties despite the working capital position. Perhaps it is taking on more debt or has a favourable agreement with Blue Marble where payment is upfront for the services. I am very happy with my position in LVI. Either management is completely incompetent to think that it can operate with a -$2.5 million working capital deficiency over the next year or it knows a lot more than we do about its imminent revenue and cash flow prospects. Q3 financials are due at the start of March. 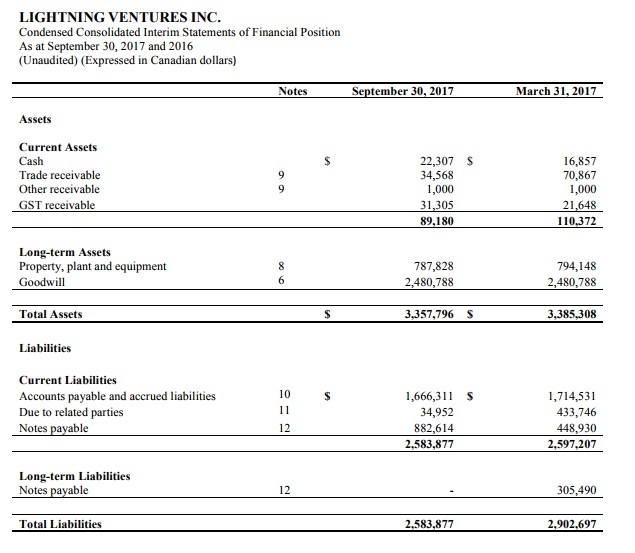 Luckily LVI's year end isn't December 31 so we don't have to wait until the end of April to see the next set of financials. The company's claim of being cash flow positive was in September and that next report will cover October to December so there should be no ambiguity the next time around.